New booklet launched telling the story of Greening Wingrove from 2012 until this autumn. When Greening Wingrove started out as a small seed of an idea seven years ago, few guessed at the impact it might have. Cllr Nigel Todd, chair of Greening Wingrove Community Interest Company recalls. “A small group of residents, ward councillors, and staff from local voluntary and Council services, met to discuss our problems of litter and fly tipping. Not many people had responded to challenging this endemic grime. But the meeting changed everything. Using an idea from Vancouver, Canada, we hit on the perspective of looking at an apparently intractable problem through a ‘green lens’. 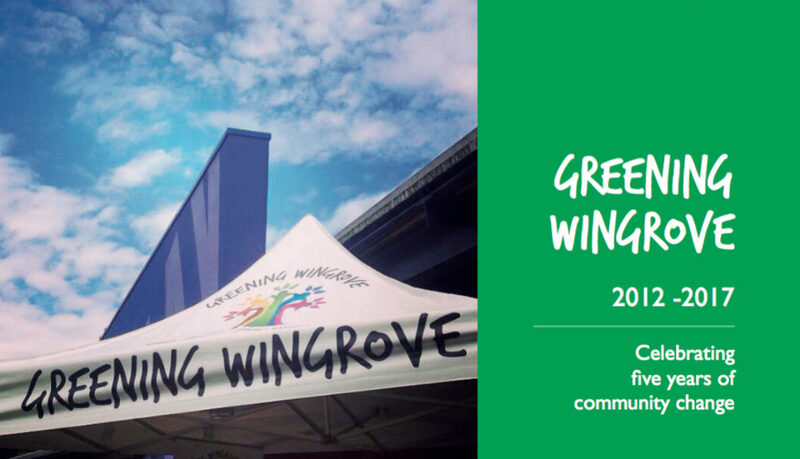 Greening Wingrove was born! “As a result, fresh energies were unlocked, taking us in directions that eventually encouraged people to start dealing with the refuse mountain. The Council ward committee pumped life into Greening Wingrove, letting residents have a say in giving Wingrove groups and organisations, (ranging from allotments to community buildings) money to implement their ‘green’ projects. It saw almost 900 people contributing volunteer time to support its aims and led to some 14,000 engagements with its work. Now a new publication has been launched, telling the story of Greening Wingrove’s legacy over the last five years. The booklet, ‘Greening Wingrove, 2012-217, Celebrating Five Years Of Community Change’ tells the story of the organisation’s impact, until its core funding ran out this autumn. You can download your copy here. Although the funding has ended, the legacy and the fruits of its labour remain and will be carried on by its successor organisation, Greening Wingrove CIC.